The New Year has begun and the days are cold. This is the time of year when a person can take a breath of cold and crisp northwest air, smell the pine needles, cedar trees and ocean wind and be filled with exhilaration. Chilly, clear weather is a fine time to be on an adventure away from your normal day. Either a trip to the city or a backpacking excursion can do the trick but having the right supplies will add the needed comfort when underway. On cold days, try bringing a thermos full of salmon chowder with you. Here is a recipe chalk full of smoked salmon and leeks for a smooth and rich chowder to warm your rib cage. This is a delicate, light-tasting soup. Two pouches from the Smoked Sockeye Salmon Six Pack will suffice. Bring clam juice to simmer in medium skillet. Add salmon; cover and simmer until cooked through, about 10 minutes. Transfer salmon to plate; reserve clam juice. Flake salmon into small pieces. Mix butter and flour in small bowl until well blended. Cook bacon in heavy large saucepan over medium-low heat until crisp, about 5 minutes. Using slotted spoon, transfer bacon to paper towels. Add leeks to drippings in saucepan; sauté 3 minutes. Add potato and reserved clam juice and bring to boil. Reduce heat; cover and simmer until potato is tender, about 10 minutes. Add milk and bring to boil. Whisk in flour mixture. Reduce heat; cover and simmer until potato is tender, about 10 minutes. Add milk and bring to boil. Whisk in flour mixture. Reduce heat; simmer until soup thickens slightly, whisking frequently, about 3 minutes. Stir in cream, chives, salmon and bacon; simmer until heated through. Season with salt and pepper. If you have received an Amazon.com holiday gift card during this holiday season you can use it to receive wild Pacific smoked salmon from us. When shopping Amazon.com search "Kodiak smoked sockeye" for our Northwest style smoked salmon fillet, then order for your friends and family over the New Year. This sockeye is currently available in the traditional pine box for rustic appearance. Amazon.com makes ordering easy and if you are a salmon lover you will appreciate being able to cash in your gift card for premium salmon. Holiday hors d'oeuvres are never better when using smoked sockeye fillets and FBS will help you with your recipes on the blog and recipes pages! FairhavenBaySeafoods.com hopes you had a great Christmas time this week and sees the new year as a time of possibility and happy surprise. Here in the Northwest the evenings are cold but the fireplaces are warm and nothing is more enjoyable when writing on the computer than to have late night snacks on your coffee table. Nutritious yet fulfilling, the natural smoked fillets sold here at FBS can be broken apart and coupled with nearly any cracker or vegetable stick for a robust, smokey treat that satisfies. If you are a gift giving party goer, offering a full size fillet will sure to please. This is wild premium salmon from the icy Pacific that makes our holiday get togethers that much nicer (being able to enjoy something fancy). Christmas is upon us and New Year's is fast approaching. Celebrate in style with friends and family this year. The holidays are a time of abundance and should be relished with the ones you love. It is good for the spirit to go all out with lavish arrangements and FairhavenBaySeafoods.com can help with the dining accoutrements. Variety is the spice of life and a fine addition to any cocktail party is a smoked salmon platter. Feature your Northwest catch as a centerpiece to be devoured or multiple preparations from dips with crackers to petite hors d'oeuvres. Any way you choose, your guests will be impressed that you have chosen the best. Orders with free shipping are still being accepted through Christmas Day. Spend $70 and get free shipping through December 25th!!! Fiber box products have been so popular this year that the staff at FairhavenBaySeafoods.com have been able to offer savings for a longer period. The spending limit has been reduced and now all you have to do to not pay postage is cross the $70 line with your purchase. FBS offers the same great wild smoked salmon fished from the Pacific for consistent quality. Appetizers are made easy with our products and the holidays are dressed up nicely with Northwest style smoked salmon hors' doeuvres. At FairhavenBaySeafoods.com the best fillets of wild Alaskan salmon are neatly packaged in premium brine ingredients for a robust flavor and an incredible display. The smaller fillets (like the ones found in the Smoked Sockeye Salmon Six Pack) work wonderfully in simple recipes like this. For an upscale twist on the regular version, this mixture can be served alone or on a bed of greens. Combine Dijon mustard,dill,olive oil, orange juice,orange zest, salt and pepper in a small bowl, mix well. 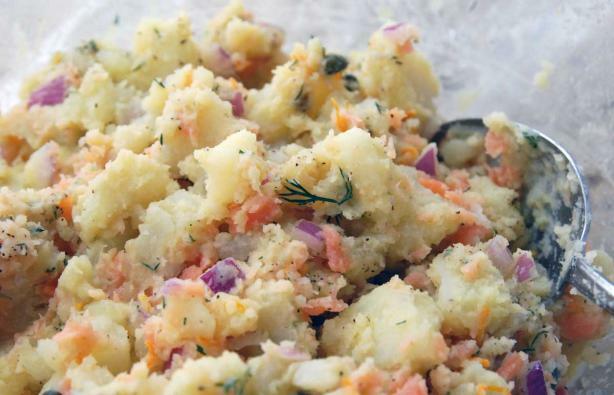 Combine cooled potatoes,salmon,onion and capers in a large bowl, toss to mix well. Pour dressing over potato mixture and toss to mix well. Hurry now to get those Christmas and New Years appetizers ready at sale prices. The holidays are nearly on us and there is still time to prepare for your guests while saving. In nearly one week the sale of "spending $70 and receive free shipping" will be over. The best products are being offered at sale prices due to packaging changes. We get to save money so YOU get to save money. New decorative, lighter packages allow for less postage. Place your orders in the next 6 days, qualify for the deduction, then let the cocktail parties commense. Fiber box products have been new and successful this season and so we are taking care of the shipping for you. The shipping promotion was extended and increased to help you save some money during the holidays and entice your taste buds with different flavors of wild salmon. Choices vary from lemon dill, peppered pink, natural pink, natural sockeye, and peppered sockeye. Spend over $70 and your shipping is free. Fresh Pico De Gallo and sour cream or Greek yoghurt is a great accompaniment to this appetizer served best on a cold evening. Soak sliced onion in a bowl of ice and cold water 15 minutes, then drain well and pat dry. While onion soaks, stir together cheeses, chives, zest, and pepper in a bowl with a rubber spatula until combined well. Spread about 1 1/2 tablespoons cheese mixture evenly over each of 2 tortillas (keep remaining tortillas covered with plastic wrap). Top 1 tortilla with an even layer of salmon, covering cream cheese completely, then top with other tortilla, cheese side down. Make 5 more quesadillas in same manner, then stack on a plate and chill, covered with plastic wrap, until ready to heat. Halve, pit, and peel avocado, then cut lengthwise into 1/8-inch-thick slices. Lightly brush avocado slices with lemon juice. Heat griddle over high heat until very hot, then reduce heat to moderate. Lightly brush 2 quesadillas on both sides with some oil, then toast on griddle (1 at a time if necessary) until undersides are golden with some blackened spots, about 1 minute. Flip quesadillas over with a spatula and toast until undersides are golden with some blackened spots, 1 to 2 minutes, then transfer to a baking sheet, arranging in 1 layer, and cover with foil to keep warm. Toast remaining quesadillas in same manner, using a second baking sheet. Heat remaining oil in a 12-inch heavy skillet over high heat until hot but not smoking, then cook tomatoes, stirring occasionally and seasoning with salt and pepper, until just beginning to soften, about 1 minute. 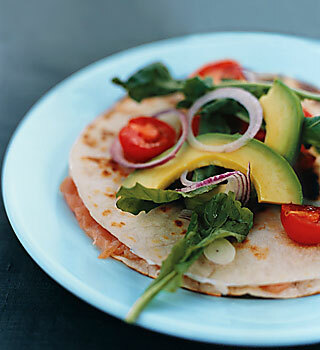 Transfer quesadillas to plates, then top with onion, avocado, tomatoes, and arugula. There are just hours left to take advantage of the Black Friday week sales here at FairhavenBaySeafoods.com. Today is Cyber Monday and specials are everywhere. This is one of the best times to order hot alder smoked salmon on the internet. Fresh, wild sockeye at low low prices are found on the products page here at FBS. The free shipping prices and the discounted fiber box products will be adjusted soon, but don't fret if you miss it because there are more savings for this season announced tomorrow. Remember you can order our smoked salmon from Amazon.com as well if you are out surfing Cyber Monday specials this evening. Hopefully everyone had a great Thanksgiving this week. If you feel you have missed some of the Black Friday opportunities there is still time! Shopping sales at FairhavenBaySeafoods.com can be done all week at reduced prices satisfying those on your Christmas list. Sale prices end this Monday but that is still a couple of days away. The Black Friday week sale is the best time to purchase wild smoked sockeye salmon supporting sustainability and your local fisherman. This is the finest Alaskan waters can offer, low in sugar, high in protein, and bursting with flavor. These fillets crumble like chocolate truffles in your mouth with just enough moisture to lend themselves well to cooking or just eating straight. For under $30 dollars the Smoked Sockeye Salmon Medley lets you try three different flavors of salmon with just one order. This is CHEAP for the quality of product you receive with FairhavenBaySeafoods.com. Ordering online is just a couple easy steps. The Medley is one of the best purchases you can make if you want variation in preparation. It also is the oiliest salmon (considered the best by connoisseurs) so it is naturally rich in Omega 3 and Omega 6 fatty acids. These cancer reducing antioxidants are packed in every envelope with the flavors of "Natural", "Peppered", and "Lemon Dill." Because it is arranged in a fiber box you qualify for a reduction on the Smoked Sockeye Salmon Six Pack. If you know you like wild sockeye salmon and you want to stock up at sale prices, order during THIS WEEK through next Monday (Cyber Monday) for the Black Friday sale week reductions here at FairhavenBaySeafoods.com. The reduced prices at FairhavenBaySeafoods.com allows for a little reprieve from the excessive spending typical of this time of year. The Smoked Sockeye Six Pack is reduced in price and because of individual portioning and packaging on fillets you can split the purchase up. Keep a couple of fillets for yourself and satisfy others with gift giving. The cold mornings are easier dealt with when your prepared. The right wool socks and a hearty breakfast can go along way in being equipped for what the day sends you. 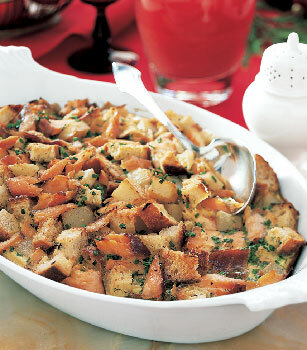 Try this warm casserole in the morning to fuel your body well before any big day. Hot-smoked fully cooked salmon is flaky in texture and fragrant with alder smoke. This dish can be completely assembled and chilled one day before baking. Preheat oven to 400°F. Arrange bread on rimmed baking sheet. Bake until pale golden, about 5 minutes, then cool. Butter 11x7-inch glass baking dish. Melt 2 tablespoons butter with oil in heavy large skillet over medium-low heat. Add potatoes. Stir to coat and arrange in single layer. Cover and cook until potatoes are almost tender, about 8 minutes. Uncover; increase heat to medium-high, and cook until potatoes are lightly browned and tender, stirring occasionally, about 5 minutes. Add shallots and sauté until soft, about 2 minutes. Remove from heat. Gently mix in bread, salmon, chives, and minced dill. Transfer mixture to prepared dish. Preheat oven to 350°F. Bake casserole, uncovered, until custard is set, about 30 minutes. Cut into squares and top with additional sour cream, capers, and dill sprigs; serve hot. With the year's best sales about to be announced, one should ask themselves "Should I shop early this year for those around me and be the organized well planned person that I strive to be or run around at the last minute with too much to do paying full price?" FairhavenBaySeafoods.com encourages you to be the former. Right now if you buy $100 worth of product you get free shipping!! More reductions are released on Sunday the 24th and will last through the next Monday (Cyber Monday). These prices already rival the competitors' but if you buy in quantity, more $ is taken off your whole purchase. The products at FairhavenBaySeafoods.com are great for game day or holiday gift baskets. This is high protein, nutritious wild salmon fished from icy Alaskan waters by sustainably minded fisherman. We are based in Bellingham, WA but we bring this delicacy to you when you order online. FBS makes ordering online easy saving you time and money. Plan your purchase now and cash in on the savings all week!!! Only a couple days left before the Black Friday week sale here at FairhavenBaySeafoods.com! Sunday, November 24th through Monday, December 2nd has the deepest discounts of the year applied to new and regular products. The Products page will give you the descriptions of smoked salmon specials to help you make your decision on which package is right for you. Each fillet is prepared in the Northwest style, packed in their own juices, and come in different sizes and flavors. The Gourmet Gift Box page is a great way to buy for a family and the Specials page will let you know about the latest product releases. Mash eggs coarsely with a fork, then stir in shallot, tarragon, capers, mayonnaise, and salt and pepper to taste. 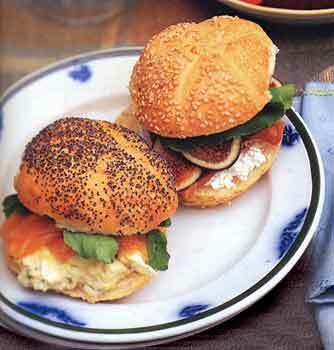 Make sandwiches with rolls, egg salad, watercress, and salmon. For those who want quality. If you are just wanting smoked sockeye salmon in a modest amount but do not want to lose moisture from an open pack, the Alaskan Smoked Sockeye Duo is for you! Simple and delicious. Two 8 OZ. fillets of wild Alaskan Salmon are preserved in the reliable mild brine and natural juices you have come to love with FairhavenBaySeafoods.com then sent to you in our new fiber box packaging. The Alaskan Smoked Sockeye Duo is currently priced reduced during the holiday season. November 24th Reveals Black Friday Sale! Just seven days from now the best savings of the year will be announced. You will have one full week to choose your selections at fantastic sale prices. Remember that when you spend $85 dollars or more shipping is free to any one address on all fiber box selections! Cash in on price reductions as well as postage during the week of Black Friday which starts on Sunday and stretches through the next Monday. If it is only sockeye salmon you are interested in, the Smoked Sockeye Salmon 6 pack will work for you. 6 fillets- 6 oz. each, packed in natural juices, and individually wrapped in pouches for long shelf life. This product is good for giving out to friends or stuffing stockings during the holiday season. Since the holidays are just around the corner, buying in bulk gives you a chance to satisfy discerning tastes and provide for friends and family in one swoop. Multiple flavors are here in one package with the Smoked Sockeye Salmon Medley. Alaskan sockeye is hot alder smoked but seasoned 3 different ways so you can mix and match your condiments and accoutrements to the appropriate fillet. All fillets are naturally organic and wild, fished from Pacific waters, and bursting with flavor. The best of the salmon family is seasoned with the choices of lemon dill, peppered or natural. This Smoked Sockeye Salmon Medley is a good idea as a present. The ensemble is sure to please your gift recipient because you are giving them choices. The holidays are coming so pick one up for the parents today.